Environmental watering in the King and Buffalo rivers during autumn 2016 aimed to benefit native fish. The King and Buffalo rivers are part of the Ovens system. "Commonwealth environmental water was released into the King and Buffalo rivers to provide some variability in flows and inundate new habitats for native fish," said North East Catchment Management Authority's (CMA) Catherine McInerney. "Environmental watering allows connection between different habitats, which enables native fish species to flourish, and provides a range of new food resources and habitats for waterbugs." Fish movement throughout the system relies on unimpeded access that requires adequate flows and the removal or modification of barriers (such as weirs). The North East CMA is in the process of providing fish passage on all remaining weirs in the Ovens system below Lake Buffalo and Lake William Hovell. The Ovens system has also seen a successful recovery project for trout cod, and efforts to reintroduce Macquarie perch are currently underway. Frogs (such as the giant bullfrog and growling grass frog) are abundantin the lower Ovens River and associated wetlands and in the King River upstream of Cheshunt. Environmental water released into the Ovens has helped improve its health. 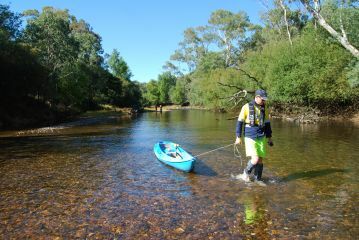 This healthier river attracts people engaged in fishing, boating, kayaking, waterskiing, swimming and bushwalking.